Did supernova 2005md make a comeback after 3 years? According to today's THE ASTRONOMER Electronic Circular No 2426, there is either a new supernova just 1/2 arc second next to the location of SN 2005md - or this supernova has suddenly rebrightened: "KAIT images of Feb. 11-13 UT show an object (at mag 18.5) at: RA 06h47m19s.10 DEC +33 34' 24.5" (2000), which is 21.7"E and 23.1" N of the nucleus of NGC 2274. This position differs from the reported position of 2005md by 0".1 in R.A. and 0".4 in Decl; 2005md was discovered on 2005 Dec.25.35 at mag 18.1 (CBET 332) and was classified as a possible young type-II supernova by Modjaz et al. (IAUC 8650). However, the reported spectrum only showed a featureless blue continuum, with no obvious broad supernova features. 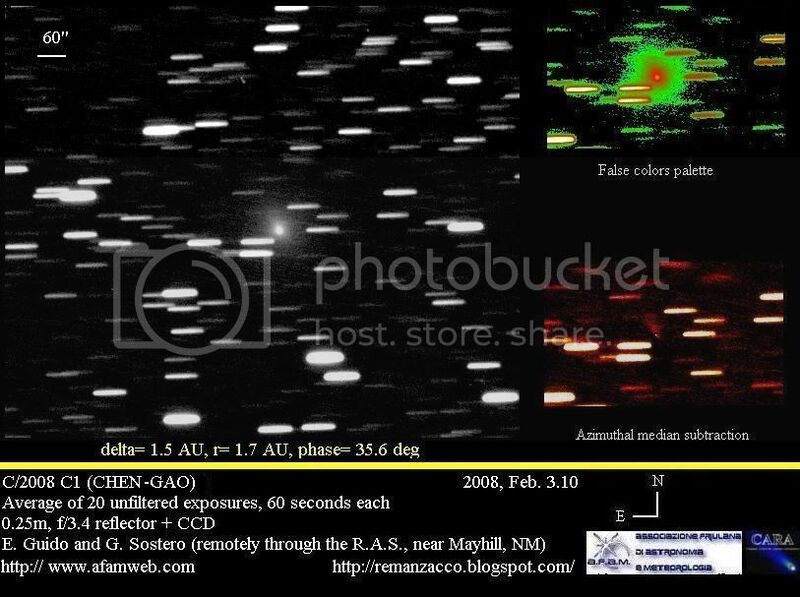 KAIT images of 2005md also showed that the object declined quickly, and it was fainter than mag 19.8 in 2006 January. At the distance of NGC 2274 (about 70 Mpc), 0".5 corresponds to a linear distance of about 120 pc, so it is possible that the object detected in the 2008 Feb. images is a new supernova very close in position to 2005md and that the two objects are unrelated." In other news comet Holmes is now closing in on the California Nebula, leading to spectacular images already. And an impressive animation shows the opposition effect on Saturn's rings (rings get brighter when the phase angle approaches 180°, planet does not). This blogger had the rare opportunity at the CAP 2007 conference in Athens last year to see a Microsoft presentation of a piece of software not yet released: a development version of the WorldWide Telescope was demonstrated during a talk - including a deep crash of the presenter's laptop, something sometimes seen during Microsoft promos ... Still what we saw in Athens was amazing: a very smooth, almost flowing GUI, accessing numerous and very different astronomical databases. It looked a bit like Sky@Google Earth which has come out already, but the final and also completely free product could well become an even more powerful tool for astronomy visualization. Now a newer version has been shown at another conference to rave reviews - and in spring we may well see the first release. In other news Jim Oberg goes after myths about the USA 193 destruction - which for the DoD is history but not for those responsible for launching another secret NRO satellite, NRO L-28: They have decided to keep their Atlas V grounded for a while until the remaining debris has reentered. They were obtained with the Goldstone radar in the 2nd half of 2006 when the geometry was particularly favorable and the Moon showed the Earth about as much of its rugged south polar region as possible. Now NASA has presented the results at news conference in Denver (in which this blogger participated via phone): the 3D images with 30 to 40 meters resolution are by far the best of this particular region of the Moon which is considered for future unmanned and even manned missions. Within a small area the topography varies by 12 km while on the whole Earth that variation is only 9 km. In other news Venus & Mercury are in conjunction in the morning sky - and 17 numbers have been assigned to larger debris particles from the destroyed satellite: One observation by an amateur could indeed be one of these. ... even though it's controversial whether one can talk about an actual 2nd outburst: The light curve of Holmes' nucleus shows a spike after Jan. 25, and A. Peirera reported on the same day about "a small non-stellar central condensation" seen with several instruments. To him "for many weeks the coma has looked very uniform, with a flat brightness profile in the 5x22 monocular, so tonight it was quite a dramatic change". Exactly 4 months after the (main) outburst began, Holmes could still be seen with the naked eye under really good conditions; otherwise the comet has even become a tough object for good binoculars. In other news even at 11 arc seconds experienced observers can still get a lot out of Mars while others recorded a radio storm from Jupiter. How the Peruvian impact crater formed last September is still mysterious - and the military part of the U.S. Navy vs. USA 193 operation is now "largely" over: Special teams that would have dealt with debris on the ground have been stood down, and the ships involved in the operation off Hawaii have returned to their normal business. That is the word today from the DoD: "Based on debris analysis, officials are confident the Feb. 21 missile intercept and destruction of a nonfunctioning National Reconnaissance Office satellite was successful in destroying the fuel tank and reducing risk to people on Earth [...]. The Joint Functional Component Command for Space at the Joint Space Operations Center, at Vandenberg Air Force Base, Calif., is tracking less than 3,000 pieces of debris, all smaller than a football, which have not yet reentered the atmosphere. To date, there have been no reports of debris landing on Earth, and it is unlikely any will remain intact to hit the ground [...]." How the whole affair played out for satellite watchers can now be listened to, courtesy of the Starlight Zone: M. Sluka describes his observations of the debris passing over British Columbia and T. Molczan talks about tracking USA 193 before its demise. Did Holmes undergo a second - if minute - outburst after all? Already on day one of comet 17P/Holmes' dramatic outburst back in October 2007 attention was drawn to the fact, that its last outburst in 1892 had been followed by another sharp rise in overall brightness. Would that pattern repeat? After all, eruptions coming in pairs seem to be almost a defining feature of these mysterious outbursts! Nothing at all, however, was reported by visual observers in the four months that today have passed since Holmes' 2007 eruption. But now M. Kidger (in The Astronomer 44 #526 [Feb. 2008] 266) draws attention to a brightening of the comet's inner coma by 0.5 mag. between 2008 Jan. 20 and 21 - recorded by four observers - when it also "took on a much more stellar appearance" and the "radial brightness of the coma became suddenly steeper." The lowest of the light curves here shows what Kidger means. Over the following 10 days the coma faded steadily, and then there was another, smaller event on Jan. 31. In other news there's a brief report on how it felt to shoot at a satellite, with the statement that in "the next three to four hours" following the hit of USA 193, "a lot of it was burning up as it was coming down" - but neither here nor anywhere else have we heard so far how much mass in how many fragments is still left in orbit. 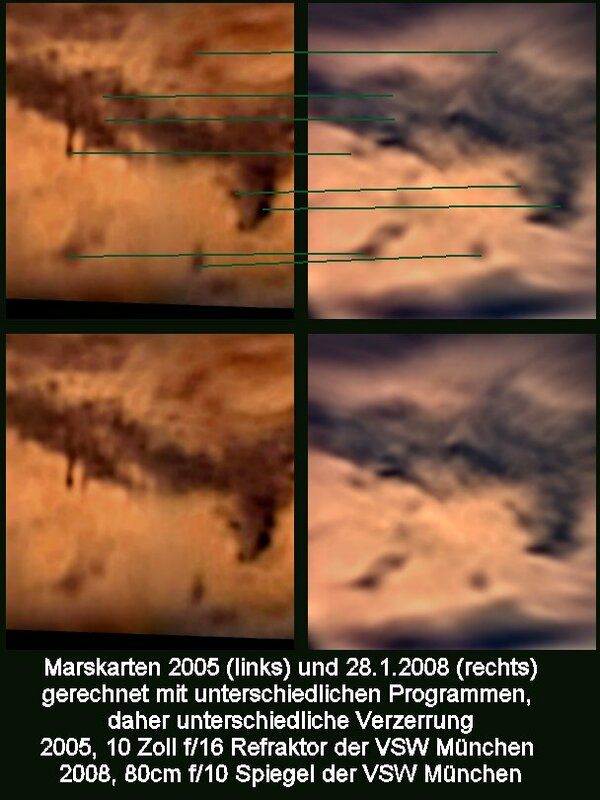 No individual numbers have been assigned to any debris, though there was another sighting of a possible larger fragment. Also, yet more images of the lunar eclipse have appeared, showing e.g. the changing umbra pattern during totality, everything at once or the eclipsed moon in detail. And here is what the wire services would sell you. In a few months a unique spacecraft which was launched in 1990 and has been observing the Sun from high latitudes will freeze to death, ESA and NASA are telling us: a glitch is preventing power from being rerouted to keep Ulysses' hydrazine fuel from dropping below its 2°C freezing point. Once the fuel freezes, there will be no way to control the spacecraft. The mission team will try to keep the spacecraft running for the next few weeks, but then its mission - extended numerous times - will come to an end. In other news the first (potentially) interstellar particle track in Stardust's collector has been extracted on Feb. 13 - to find these elusive tracks in the first place, countless volunteers have been visually checking microscope images. Get ready for the opposition of Saturn on the 24th. And during the lunar eclipse (here it is in an all in one picture and as a nice sequence) a minor impact flash was recorded. What we have afterwards is a debris field. We're tracking that debris field. It is already starting to reenter. We're seeing reentries in the Atlantic and Pacific right now, and we'll track that over then next 24 to 48 hours. It generally takes us about a day to two days to start to get a good sense of each piece of material that's up there. Thus far, we've seen nothing larger than a football, which tells us that we're in the right area. But again, it's not conclusive, because it's going to take us more time to make sure that we've got all of the reporting in, we've been able to correlate the data." Those data, howewer, have not been presented per se, and so even the mainstream press like the NYT, MSNBC and Space.com is now discussing a handful of amateur observations. A later one is actually rather confusing as one massive object was seen in the satellite's orbit. More reentries - which can be amazing - could be observed now. In other news many more pictures of the lunar eclipse this morning have been received. e.g. the rising partiality in the shadow of Haleakala (high-res) or the eclipse against Lick Observatory. Many pictures have turned up in the usual gallery and another one and come from many individuals (more, more, more, more, more, more, more, more, more). At a news conference at 12:05 UTC the DoD showed a short video of the actual intercept: You see an explosion, an expanding vapor cloud and a field of many small fragments. Many of those fragments have already reentered, none of them "larger than a football", and there are no reports that anything has reached the ground. Since the interceptor rocket carried no warhead, the explosion and vapor cloud are strong evidence that the hydrazine tank was breached and thus the (official) primary task of the operation fulfilled. It will take another 24 to 48 hours, however, to be really certain about that. One surprise for the military: that all fragments seen so far are so small. There are photos from Hawaii that may show the hydrazine trail in the sky and perhaps also the debris field (technical data and hi-res). Only hours after the operation a report from Canada spoke of "many debris trails" seen during the lunar eclipse that seem to be related to USA 193's remnants. The pattern would indicate that "the fragments have spread far and wide". Some dramatic DoD pictures of how the operation played out on the ground are also available. Now the official word from the Pentagon: "Succeeds In Intercepting"
So says the first Press Release after the action: "A network of land-, air-, sea- and spaced-based sensors confirms that the U.S. military intercepted a non-functioning National Reconnaissance Office satellite which was in its final orbits before entering the earth's atmosphere. At approximately 10:26 p.m. EST today, a U.S. Navy AEGIS warship, the USS Lake Erie (CG-70), fired a single modified tactical Standard Missile-3 (SM-3) hitting the satellite approximately 247 kilometers (133 nautical miles) over the Pacific Ocean as it traveled in space at more than 17,000 mph.USS Decatur (DDG-73) and USS Russell (DDG-59) were also part of the task force. The objective was to rupture the fuel tank to dissipate the approximately 1,000 pounds (453 kg) of hydrazine, a hazardous fuel which could pose a danger to people on earth, before it entered into earth's atmosphere. Confirmation that the fuel tank has been fragmented should be available within 24 hours. Due to the relatively low altitude of the satellite at the time of the engagement, debris will begin to re-enter the earth’s atmosphere immediately. Nearly all of the debris will burn up on reentry within 24-48 hours and the remaining debris should re-enter within 40 days." More at a news conference on Feb. 21 at 12:00 UTC. In other news the total lunar eclipse also worked at the same time: Here are the best pictures I've seen so far (and totality is over for only 1/2 hour), while more are here and here. And then there is a report from close to where this blogger sits right now (who had great views right up to totality). STOP PRESS: Navy shot at satellite at 3:30 UTC - and hit it! CNN's Anderson Cooper show just broke the news, based on two unnamed sources at the Pentagon, that the Lake Erie fired an SM3 at USA 193 at 3:30 UTC (actually the time predicted here 2+ days ago), and apparently managed to damage it. Official word on the outcome of the operation is expected within an hour - but then again the information policy described only 1/2 day ago wasn't followed here ... Just before the hit, USA 193's orbit was decaying at 1.6 km/day. A full transcript of a DoD background briefing - meaning that the speakers remain anonymous - has just been released. It took place on Feb. 20, only minutes after the Atlantis had returned from space. Key statements (emphasis mine): "So we're now into the window, okay, the length of the window. There's some significant ambiguity at the back end of the window, based, as I said at the time, on how high the atmosphere is on any given day, because that then tells you when the satellite naturally would start to hit the atmosphere. So we want to catch it before it naturally hits the atmosphere, because when it hits the atmosphere, it tumbles and it's next to impossible to track. So we're pretty comfortable right now that we'll have windows available to us through about the 29th or 30th. We're looking for a day window because it allows us to align all of our sensors. And we're looking from what we would call several different ends or phenomenologies, so visual, infrared, radar, anything that we can get to see this thing, but for the most part we're looking to be in the daylight to do this best - okay? - for all of those reasons. So that means it's going to be nighttime on the East Coast. Okay? And the windows over that span of days will pretty much traverse the whole night, so I can't really tell you, you know, exactly what time, but what I will tell you is that when we attempt to take the shot - and I'll leave it at not when we take the shot - when we attempt to take the shot, we will tell you within an hour afterwards what happened on that shot. Attempted it, nothing happened. Attempted it, it flew away and missed. Attempted it, it flew away and we think it hit it, with reasonable confidence, high confidence. That's probably as much as we're going to know. We'll have a sense that we hit based on the reporting. That information probably takes about an hour to get back and get some confirmation from at least a couple of different sensors so we don't have a single anomaly and try to trace that and then we have you off chasing that information. But we're going to try - within an hour, we'll get a press release out that will say we've attempted and here's what that attempt netted us to the best of our knowledge. And then the intent is, as early as you're willing to get up the next morning, I'll do an availability and give you as much as we have, which should get us at least a few hours' worth of information to correlate sensors, pull data in from around the globe, and then provide you with whatever I can provide you at that point." In other news the SOLAR observatory installed on the ISS' latest addition Columbus has already delivered the first data. A lot more visuals of the Feb. 19 U.S. bolide have become available, mainly video clips but also stories in many places. So far there is no evidence for a meteorite having been dropped. More mysterious is a case in Bali, Indonesia, in early January, where a crater may have formed - but details are sketchy. "About the meteorite fall in Bali, we still have no confirmation regarding the research of the stone," Avivah Yamani of the Indonesian Blog tells this one: "The stone is in geologist hand to be proved as meteorite or not. But according to astronomer from Indonesian Institute of Aeronautics and Space and also from Bosscha Observatory several days after the fall, it is indeed a meteorite fall and the crater in the rice field had caused by the fall." When observing the moon in eclipse, esp. in the (tonight 50) minutes of totality, do so repeatedly and perhaps make some notes: The pattern of colors on the lunar disk, caused by sunlight refracted into the Earth's umbra, sometimes changes minute by minute, in ways you may not expect. These patterns are not sharply defined, of course: Thus they are not seen best in a telescope with a magnification so high that the Moon fills your field of view. Rather observe them with low-power binoculars - or even your naked eye, if your vision's acuity permits. Photographing the changing color patterns is easy with modern digital cameras, even compact ones: As for the eye, high magnification is not necessary or even detrimental. Finally, while total lunar eclipses are much more sedate sky shows than total (or annular) solar eclipses, they have their key moments that can be defined to the nearest minute or perhaps even second. This is actually a topic of current - though virtually unknown - research: How precisely can you time the onset and end of totality when the last penumbral light is vanishing or returning? This kind of observation with the naked eye has even some profound historical implications: If you could time totality to a minute or better you had a means to reset your ship's clock on the high seas, a potentially crucial step in getting your longitude right. Much of what I just said are lessions from the last TLE which I could observe under perfect conditions in California or from its Saros predecessor which I - what a coincidence - also had the pleasure of seeing in dark conditions in another part of CA. Without that 1989 experience I might actually have never chosen a desert site for the 2007 TLE: If you've never seen an eclipse under these conditions you just don't know what you miss ... Talking about missing: Should you be clouded out (or in Asia or Oz where this TLE is invisible), there will be dozens of webcasts attempted, eg. here, here or here. There will also be a video broadcast - and a challenge for one lunar orbiter. "All of the sudden there was like an explosion with intense, brilliant colors of pink, orange, bright blue and green," writes an eyewitness, "then a bare space on it’s trajectory and then a HUGE explosion of color! Bright, brilliant, colorful, amazing. It was brighter than the full moon which I could see in my mirror behind the car. What a way to start the day!" That was the scene this morning around 5:29 a.m. in the Northwestern U.S., be it in Oregon or Washington state. In other news a second NOTAM 24 hours after the first has been issued, with the original one still in effect: Apparently the military wants to try its first shot indeed at 3:30 UTC on Feb. 21 but is worried it won't be ready in time and thus wants a reserve time slot. No further official details about the procedure have been released, but there are plenty of independent attempts to model the complex operation (summary, yet another very detailled analysis and the illumination conditions). USA 193, which can be as bright as Betelgeuse, is currently decaying at 1.2 km/day. Satellite attack planned for Feb. 21 - right during the lunar eclipse? A Notice to Airmen has been issued closing a zone near Maui for air traffic on the morning of Feb. 21 from 2:30 to 5:00 UTC - and the to-be-hit satellite USA 193 is crossing that very zone around 3:30 UTC. Furthermore it has been noted that this is during totality of the total lunar eclipse that night which may aid the optical tracking of faint fragments. Since the space shuttle Atlantis will land on Feb. 20 no matter what, a Feb. 21 date for the first shot makes sense; also it's smack in the middle of the best week for the 'engagement' as defined in the Feb. 14 press conference. So if you want to see USA 193, you better hurry up! In other news the third GLOBE at Night activity will commence on Feb. 25: "Both the 'classic' GLOBE at Night exercise that anyone can have fun doing with their unaided eyes, and a digital effort to obtain precise measurements of urban dark skies are offered again this year, in anticipation of a massive coordinated global effort with both versions during the International Year of Astronomy 2009." Success in Japan: When the well-known double asteroid (90) Antiope occulted a star on Jan. 2, one observer caught the main component passing in front of it while quite a number of video observers recorded an occultation by component B. Many more observers didn't see the star wink out, but this is also of some importance as the first analysis of the observations in CBET #1263 of today shows: The best-fit ellipse to the observed chords of the occultation by component B has dimensions of 89±4 x 82±1 km. As there was only one chord observed for component A, the diameter of that body cannot be determined from the occultation. However, two specific 'miss' observations constrain its location and size which is about the same as B's. 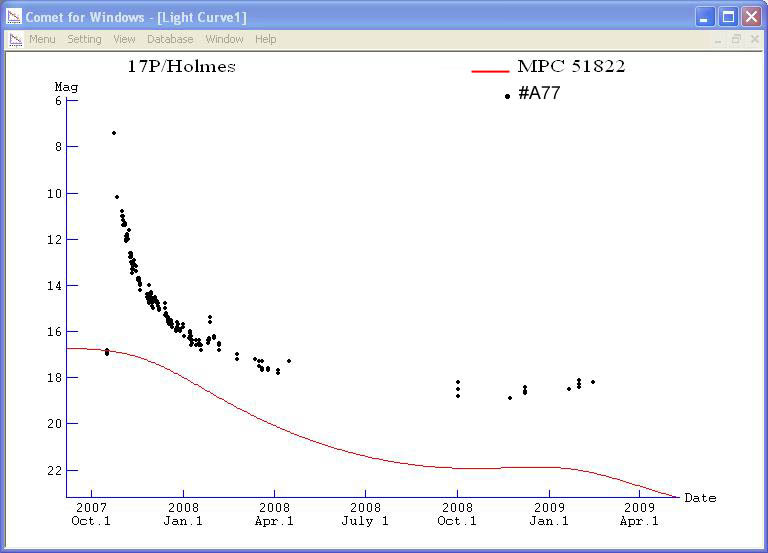 In other news an analysis of the lightcurve of 17P/Holmes reveals a fading with 5 log r (r being the istance from the Sun): "That is, the comet became fainter only because the distance increased. The dust shell itself did not fade at all, just it became somewhat more distant. The formula suggests that the comet will keep so bright as 6 mag in the next autumn and winter." Here is a nice view of the LBT at night, Ed Hubble will get a U.S. stamp this year - and this blogger has become aware of a remarkable 'Armageddon' parody, a 30-minute animation feature film created by a 20-year old. 1.6 km asteroid to pass by Earth on Feb. 19 - at 6 mio. km, with 12th mag. It will be brightest - around 12.5 mag. - from Feb. 15 to 18 and closest to Earth late on the 19th: asteroid (4450) Pan will keep a safe 6.1 million km from Earth then, but it's substantial size makes the flyby quite interesting. A special webpage already contains a smooth video of Feb. 13. Pan is not the only 12.5 mag. asteroid in Earth's proximity right now: The other one is the first triple NEO! Also a cool fisheye image of a fireball on Feb. 11. And more details about the satellite 'engagement', beyond what was said on the 14th are slowly coming through - while the motivation for the DoD to do it is being questioned all over the place, with sober views an exception. Also: detailled instructions for observing USA 193 - this is pretty easy and could actually improve knowledge of its decaying orbit. More amateur images of the doomed satellite are already coming in. Today the ISS becomes ... an astronomical observatory! Well, kind of: During the 3rd and final EVA on Feb. 15, Walheim & Love will install two payloads on Columbus' exterior: SOLAR, an observatory to monitor the sun, and the European Technology Exposure Facility that will carry nine experiments requiring exposure to the space environment. SOLAR consists of three detectors, two of proven design in earlier missions and a new one from Germany. While their task - monitoring solar flux and spectral variations with extreme precision - is more of geophysical than astronomical interest, SOLAR represents one of the very few science experiments on the ISS that actually have something to do with an object in space, well beyond Low Earth Orbit! Talking about the Sun, a new method called COSTEP that uses SOHO data to predict, in real-time, the approach and intensity of hazardous solar particles that would threaten astronauts and technology in space is now being tested, while an ESA simulation called DESIRE is designed to provide a European capability in accurately predicting radiation doses onboard Columbus. And talking about Columbus, here's a cool timelapse movie (speeded up 30 times) of its installation. The ISS has been filmed crossing the Moon and photographed in detail. And there finally is a new launch manifest for the shuttle in 2008: Contrary to earlier rumors NASA will try to fly the final Hubble Servicing Mission still in August, although it slips from the 7th to the 28th. In other news the WZ-type dwarf nova HV Vir ist currently undergoing an outburst, while the famous super-bright supernova SN 2006gy is still going strong in the infrared. Another exoplanet discovery using the microlensing method - the 1st one yielding several planets for the same star; "solar system analogs may be common"! - has involved several amateurs to track its complicated lightcurve. Additional radar images of the first triple NEO are out as are some more articles - all appearing 24+ hours after you read it here first! Staying with minor bodies here are comet Tuttle on the 11th and Chen-Gao on the 10th. With the DoD briefing in Q&A now, a Press Release has come out that says: "An uncontrollable U.S. experimental satellite which was launched in December 2006 is expected to reenter Earth’s atmosphere between the end of February and early March. Because the satellite was never operational, analysis indicate that approximately 2,500 pounds (1134 kgs) of satellite mass will survive reentry, including 1,000 pounds (453 kgs) of propellant fuel (hydrazine), a hazardous material. Although the chances of an impact in a populated area are small, the potential consequences would be of enough concern to consider mitigating actions. Therefore, the President has decided to take action to mitigate the risk to human lives by engaging the non-functioning satellite. Because our missile defense system is not designed to engage satellites, extraordinary measures have been taken to temporarily modify three sea-based tactical missiles and three ships to carry out the engagement. Contact with hydrazine is hazardous. Direct contact with skin or eyes, ingestion or inhalations from hydrazine released from the tank upon impact could result in immediate danger. If this operation is successful, the hydrazine will then no longer pose a risk to humans. The U.S. government has been and continues to track and monitor this satellite. Various government agencies are planning for the reentry of the satellite. In the event the engagement is not successful, all appropriate elements of the U.S. Government are working together to explore options to mitigate the danger to humans and to ensure that all parties are properly prepared to respond. In the unlikely event satellite pieces land in a populated area, people are strongly advised to avoid the impact area until trained hazardous materials (HAZMAT) teams are able to properly dispose of any remaining hydrazine." The U.S. military stressed in its briefing today that it's only the hydrazine that they're worried about - not the possibility that anything classified would survive reentry and could be collected by the wrong guys. The primary objective is to destroy the hydrazine tank, secondary one to blow the whole spacecraft into smaller pieces. The satellite will be destroyed just before it would enter the atmosphere and deorbit anyway: So as little debris as possible will remain in orbit, endangering other spacecraft, and the majority comes down soon. Also the attack will take place at a point in orbit where any debris comes down in an unpopulated area, namely an ocean. The well-understood "standard missile 3" will be used, one with two backups. Three ships will be on station. Radar and space sensors will see whether the first shot hit, but finding that out could be rather tricky and take many hours. Help solve an exoplanet mystery by transit photometry! In other news there is now talk that the U.S. might try to shoot down the reconnaissance satellite out of control which would otherwise reenter soon. The satellite has actually been imaged by an amateur, as have been the ISS once more on Feb. 12 and a Progress freighter on the morning of Feb. 11! ... or can you remember (153591) 2001 SN_263? The first triple asteroid system found (or put another way: asteroid with two satellites) has the name Sylvia. The new case is reported in the Electronic Telegram #1254: "Arecibo radar delay-Doppler images (2380 MHz, 12.6 cm) obtained on 2008 Feb. 12 show that minor planet (153591) is a triple system. Based on range extents at 75-m resolution, preliminary estimates of average diameters are 2 km, 1 km, and 400 m for the three components." There's much buzz today about yet another possible galaxy distance record (without a directly measured redshift!) - but there remains a lot to be discovered close to home, too! In other news a waste-water dump from the ISS has been observed in binoculars minutes ago, in spite of bad viewing conditions! Many more close-up pictures were taken on Feb. 11 (another sequence, also larger) and on the 10th (also an animation), plus one photographer's collection and another one from SpaceWeather. Also yet another partial eclipse sequence from the South Pole - and a fine green segment at sunset. Amateur astrophotographers are making ample "use" of the current space shuttle mission STS-122 to the International Space Station: Thanks to conveniently lit repeated early evening overflights over Europe and stable fine weather, a flurry of excellent images is appearing on the web. A few early results were already hailed here, now there are many more from Germany alone: of Atlantis closing in on Feb. 9 and of the two docked together on Feb. 10. As can be calculated by e.g. Heavens Above and CalSky there are - for Germany - two more really good overflights today and tomorrow before the viewing window draws to a rapid close. In other news there are nice pictures of yesterday's earthshine on the Moon, of Mars on Jan. 28 (which invites a comparision with 2005) and of solar prominences yesterday. 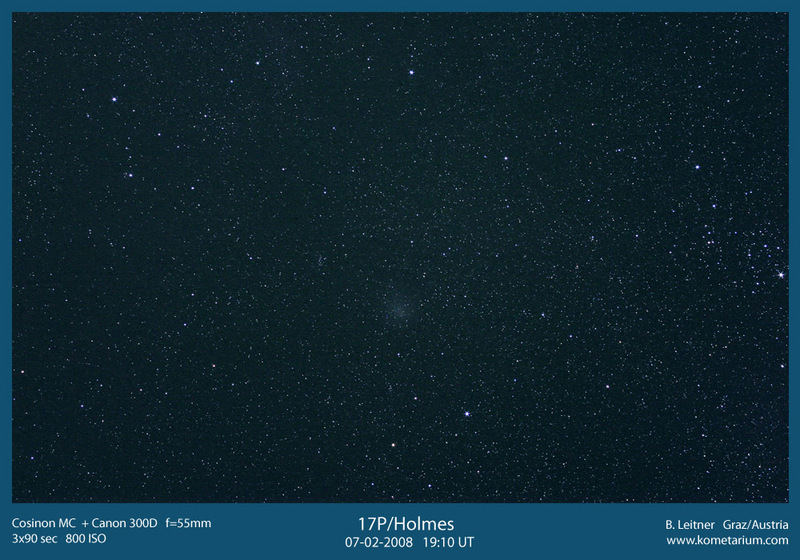 Still around is comet Holmes (scroll down for a nice wide-angle image!) which will soon be swamped again by moonlight but is still moderately easy for the naked eye in dark skies. There are reports of comet Chen-Gao brightening to 11th mag. (so that the model used in this new ephemeris could already be outdated). Also brightening is the symbiotic variable star BF Cygni which "is currently on a rapid rise to a new bright maximum," according to the CBAT ET #1251, with a B magnitude of 11.1 on Feb. 9. For Europeans, by the way, a convenient French weather site - running a U.S. model but displaying the cloud pattern well - has been recommended. And measuring cosmic distances might get even more reliable thanks to a new trick for Cepheid distance determination with the help of light echos. Electronic Telegram # 1249 of the IAU Central Bureau for Astronomical Telegrams reports today that "S. Yoshida, Gunma, Japan, writes that the quasar 0133+476 (z = 0.859 [...]; also known as DA 55 [...]; R.A. = 1h36m58s.6, Decl. = +47°51'29", equinox 2000.0) has been found to be notably bright", namely at 14 to 15 mag. since last fall while it's catalogued at 18 mag. both red and blue (but has been in the 15 to 16 mag. range before). In other news the Cosmic Log takes note of the recent solar eclipse which also brought one eclipse celebrity into a New Zealand newspaper - and there is also a nice hi-res image of the slender crescent Moon 38 hours after new moon. In other news many new comet pictures arriving show 46P/Wirtanen and its tail (even better here), the erupting 29P/Schwassmann-Wachmann 1 and Chen-Gao. And here is the lunar crescent of right now. Finally a post-eclipse report has arrived from Antarctica! "Managed to see annularity through a thin layer of clouds," writes Xavier Jubier, safely back from Mt. Vinson: "However it was quite windy up there and taking eclipse pictures was a real challenge, not to mention various camera/lens problems. Came back safely to high camp after an exhausting 21-hour journey and now preparing to descend the headwall before the next storm comes in. The return to the base camp will likely be after the storm. More when I get back home late February..."
We can hardly wait to see your pictures - but meanwhile a 2nd batch from the South Pole has been received, this time from Johan Booth who "didn't have much time to explore the optimal set-up for photography." More interesting anyway are several plots of measurements, one from "the (uncalibrated) output from our Normal Incidence Pyrheliometer (NIP), a tracking device that measures solar radiation by pointing directly at the sun; the second shows temperatures measured at a variety of elevations. It's interesting to note that the higher sensors saw essentially no impact, while the lower ones did." In other news this blogger - and countless fellow amateur astronomers in Europe - had a great time with the ISS and space shuttle Atlantis when they flew over Germany in bright dusk today at 17:43 CET: Not only could the ISS be seen - like Venus at zenith :-) - easily with the naked eye, in binoculars it could be resolved and the shuttle was visible as a tiny bright dot right in front of it. Already pictures of the close pair - since joined firmly - are coming in, e.g. via an astronomy forum - or a mailing list (here's yet another posting; always click on the "URL" link for the pix)! Already on the evening (local time) of the same day (universal time) when new moon occured, 3:44 UTC on Feb. 7 according to the USNO, the young lunar crescent was imaged just after sunset in Austin, Texas, where it should have been about 1:20 UTC/Feb. 8 or 21½ hours after new moon. (Later on the 8th the crescent was also captured in daytime from Germany.) Not bad for a direct picture taken 'without tricks' but far from any record: This was most probably set last June by intrepid selenographer Martin Elsässer! In other news here's a picture that shows comet Holmes yesterday as it really looks like to the eye in binoculars (dark skies provided) - not nearly as pretty as in high-end astrophotographs. But the comet has moved into a nice neighborhood, so to speak, and Chen-Gao is also there, at 12th mag. From the better late than never dept. here are also another nice view of the Venus-Jupiter-Moon trio of Feb. 4 and a report about airborne Quadrantid observations one month earlier. Deeply partial: first eclipse pictures from the South Pole in! In other news the transient in CMi has, after fading to 16th mag., rebrightened to 13 mag., strengthening the case that it's a WZ Sge-type system. Impressive images of Mercury's sodium tail have been obtained from the ground. Photometry of the strange and large Kuiperoid 2003 EL61 can only be explained by a weird albedo pattern. Ice clouds over Antarctica have recently been observed in parallel with the AIM satellite. The Astronomical Unit might need a new definition (and many constants are problematic in physics). The public is invited to name the GLAST satellite. And some details of the orbital decay of USA 193 alias NRO L-21 are now available. While we are waiting from news from Antarctica about today's annular eclipse - so far only pictures of partial phases from Oz (in an Ice in Space forum) or NZ have come to my attention - there is a breakthrough paper from the STEREO scientists out! They observed loops in the solar corona when the two spacecraft were 12° apart in their orbit around the Sun and could reconstruct their 3D shapes from the data. This is the first time this could be done using stereoscopy! "We demonstrate that these data allow to obtain a reliable three-dimensional reconstruction of sufficiently bright loops," the paper concludes. It is not just for the penguins: a few diehard amateur astronomers should be right now climbing Mt. Vinson in Antarctica to see the Feb. 7 eclipse as an annular one. The last report came at 7:36 UTC this morning from X. Jubier: "I made it a few days ago to the base of the highest peak in Antarctica, Mt Vinson," where several camps have been set up. "From high camp to the summit the climb last about 12 hours. Since today I had some very nice weather I decided to bring a small tent and some equipment about half way to the summit in order to reduce the time necessary to reach it." In other news we are reminded of a rare stellar occultation by a big Kuiperoid when (20,000) Varuna occults an 11.9 mag. star in the night of Feb. 10/11. Nominally the Kuiperoid's shadow doesn't even touch the Earth, but the prediction is not very precise and an occultation is possible after all. Or a potential satellite occults the star for you: whoever has access to a larger telescope, is on the right side of the Earth and has good weather should be on the lookout, preferably with a video camera. Help yourself to the Digital Terrain Model of Mars! 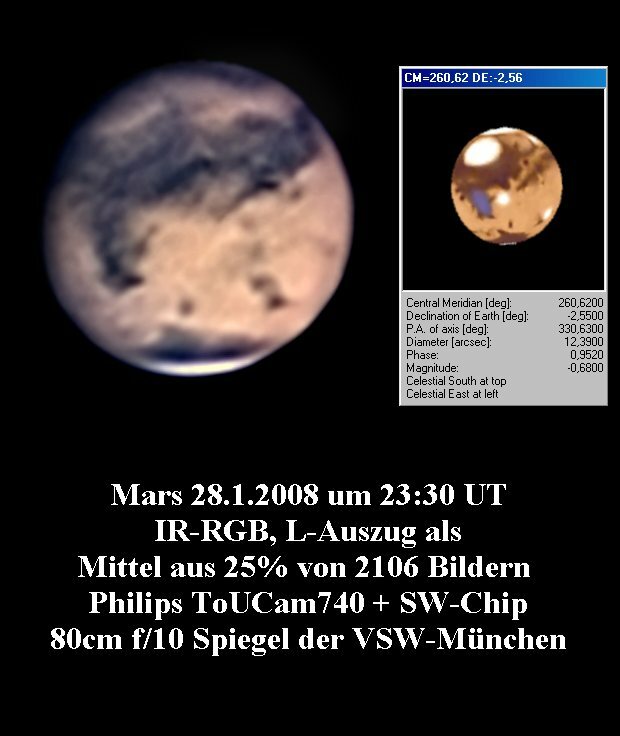 Four years after Europe's Mars Express entered orbit a dream has come true for Mars fans: The Digital Terrain Model generated from the images of the High Resolution Stereo Camera has been released - and can be accessed with a simple viewing tool at the FU Berlin in which you can set many parameters yourself! This blogger in particular likes the possibility to set the factor of vertical exaggeration - including none at all! Until now all 3D HRSC views have been presented with an exaggeration of several - now you can see Mars as it really would look like if you went there (although in false color). Try it out e.g. with Olympus Mons, one of many features to select: It's really a very flat volcano! It was discovered several days ago at 16th mag., but now SN 2008Q in NGC 524 has risen to 13.7 mag. Supernova & galaxy are located in Pisces. In other news combined meteor video & radio backscatter recordings are now online from one station in New Mexico, e.g. from a fireball last night. And here's another image of Chen-Gao from last night. It approached Earth's center to within 133,000 km (0.000888 AU) at 7 hours UTC this morning: asteroid 2008 CT1 had been discovered only shortly before the encounter when it should have brightened to about 15 mag. and has since faded to below 20th. Another close shave, but nowhere near the record holders for closest approaches to Earth. With an absolute brightness of 27.7 CT1 is only about 10 meters in diameter, so if had been on a collision course with Earth it would have burned up in the atmosphere as a nice fireball. In other news another fine picture of yesterday's Venus/Jupiter/Moon trio has turned up (this morning the Moon was long 'past' Venus as a view from Oz shows) as have nice views of the ISS that have also made it into SpaceWeather. And visual estimates of comet Chen-Gao hovered around 12.8 mag. last night and 13.5 mag. the night before. In other news a nice color image of comet Chen-Gao has been taken which might be close to Holmes on March 28. A fine picture of 46P/Wirtanen's tail has been published (but you may have to subscribe to the Comet-Images Yahoo group to access it). And the fate of the asteroid near Mars is unknown - though it certainly did not impact. 40 years ago (to the day) the song was recorded at Abbey Road studios, although it was released only almost two years later. 45 years ago the Deep Space Network was established formally (in a memo from the JPL director dated 24 Dec. 1963) although a forerunner had been around since Jan. 1958 and we thus could also celebrate 50 years of DSN this year. 50 years ago the Beatles approached their final lineup when Harrison watched Lennon & McCartney perform on 6 Feb. 1958 and soon joined them (Starr only came to the band in 1962). 50 years ago Explorer 1 was launched on 31 Jan. 1958 and the U.S. finally began to catch up in the space race, following the two Soviet Sputniks of 1957. 50 years ago NASA was created (legislation signed by Eisenhower on 27 June 1958, actual creation on 1 October 1958) out of NACA. The celebratory Beatles broadcast has already achieved one goal: lots of media attention for NASA. Incidentally the Beatles are to go where others have gone before: namely Bob Marley in 1999! And there is actually a pretty heated debate going on whether mankind should broadcast into space at all, with esp. one Russian heavily in favor and one American heavily against it. In other news pictures of this morning's Venus/Jupiter/Moon trio have come in from around the world, with the Moon's quick eastward progress evident e.g. by comparing views from Germany and Australia many hours earlier - or Germany again a full day earlier. There are new orbital elements for comet Chen-Gao (not much change), a picture from Feb. 3rd - and more details about the discoverers, courtesy of the German Fachgruppe Kometen: the discoverers are true amateur astronomers, 29 and 34 years old. Gao is a physics teacher in Urumqi and owns and operates the 7 cm telescope on nearby Mt. Shanshan, Chen helps analyzing the images. Gao's observatory is named after Xingming Zhou, a deceased fellow amateur who was a proficient SOHO comet hunter. Finally the report about an asteroid with the shortest period of all was in error and based on an orbital arc way too short: the major axis is much larger (it's object K08C00M: a=1.6 AU) as others had suspected all along. With a remote observatory in New Mexico one of the best images so far of the new comet has been taken. Here is another shot from Arkansas. Meanwhile the Chinese images have been reanalyzed with better software, and no convincing brightness trend between Jan. 30 and Feb. 2 is evident anymore. According to the first orbit the new comet will reach its perihelion in April at 1.2 AU from the Sun. The current brightness of Chen-Gao is about 13 mag. and could rise to 11th. In other news a nice Holmes image from yesterday has been published; the comet is increasingly hard to see from many places. From Italy and Poland come the latest images of the new comet: The latter one was actually the first reported confirmation of the discovery which was overdue statistically (most comets are discovered by professional sky surveys when they are very faint). In other news a particularly cool movie of NEA 2007 TU24 "running over" a helpless galaxy has come to my attention as has another website with animations and yet another one. Meanwhile an asteroid with a=0.5 (i.e. residing way inside Earth's orbit) has been discovered (HohmannTransfer has such stuff), possibly in a resonance. And the Boston Globe had a detailled portrait of an amateur astrophotographer. Comet discovery confirmed within hours! The call for observations over an international mailing list for comet specialists has led to the confirmation of the discovery within a few hours: First came a brief report, and now we already have images from a third site! In other news an observer with dark skies managed to see comet Holmes naked-eye again tonight. Yours truly saw it as well a few hours ago, under less brilliant skies and with binoculars: an ill-defined haze of light. The comet's overall brightness is now around 4 mag. 12 mag. comet discovered in China? This just in: "Xingming Observation Nova Survey may find a 12 mag new comet, the first iamge back from 30th.Jan Now It needs your help to confirm it. The comet is very bright and move fast, I suggest it is not too far from the earth." So says an announcement on the Comets Mailing List from a few minutes ago. In other news yesterday's Venus/Jupiter conjunction has also been seen in Austria, and only negative reports about the star occultation by Vinata have come in so far. Perhaps observers will have more luck with a star occultation by Lowell (again a small body but a 4th mag. star!) on April 11, visible e.g. in Southern Scandinavia. Now a real face on Mars has been found! In other news the Planetary Society has announced "Target Earth", a focus on NEOs inspired by the upcoming 100-year anniversary of the Tunguska airburst. Good stuff here, but the use of Apophis is seriously misguided: Check at JPL how Earth-based radar has been taking care of his harmless object. In other news comet Holmes is still around and - from dark sites - easy to see naked eye as a fuzzy patch of light as recent visual reports and pictures of today and Jan. 30 and 26 demonstrate.